In simple terms, when it comes to the ‘gee-gees’, success quite literally begets success. But ensuring the right begetting is being done often comes down to an experienced, award-winning horse breeder such as Waiau Pa local, Tony Dickinson. JON RAWLINSON explains. For decades, Alta Dream Lodge – run by Tony and Val Dickinson – has produced pacers for the harness racing track both here and abroad. Unfortunately, Tony says, today’s Kiwis are favouring more pastimes than simply rugby, racing and beer. Despite more sports chasing the same dollar, overseas demand for Kiwi horses remains strong and I ask whether, subsequently, New Zealand has become more breeding ground than racetrack. Future fortunes depend on New Zealand’s racetracks proving grounds for future champions, at least, he contends. Overall, Tony remains optimistic there are still enough Kiwi punters keen on racing to keep the sport’s wheels turning. 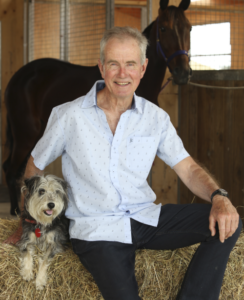 “There have been plenty of opportunities for the racing codes – that’s harness racing and gallops as well as greyhounds – to hold the line, if you like, but in the recent past they just simply haven’t done enough to hang on to their audience. Originally from Wainuiomata, Tony began breeding horses soon after he moved with his wife, Val, to a Karaka lifestyle section in the 1970s. Unlike his sister, Tony’s passion for horses was born of a penchant for a well-placed wager. “My sister, Ann, was the one into riding; she was with the pony club and later rode with the Pakuranga Hunt. She actually married into the Eisdell Moore family [well known for their connection to the hunt],” he reflects. One of the Dickinsons’ most successful broodmares not only reaped rich rewards on track but also produced a veritable stable of champions. “The foundation blood in Alta Camilla is very strong and there has been a prolific number of winners from her, including Alta Maestro. He broke the New Zealand 1700m mobile record for 2-year-old pacers last March,” he says. For many years, plenty of winning runs on the race track have begun with Tony Dickinson, owner of Alta Dream Lodge. So, it’s only fitting that, late last year, the veteran horse breeder claimed a win of his own, recognised for his ‘Outstanding Contribution to Harness Racing’ at the North Island Harness Racing Awards in Pukekohe. When the ‘who’s who’ of the horsey set descends on Karaka for February’s Australasian Classic Yearling Sale (for standardbreds), Tony expects a filly named Alta Louisa, in particular, will catch the eyes of buyers. A colt, Alta Destiny ñ from an American mare, Samantha Q – is also one to watch, he believes. Previous articleOur filly has a name! Blame It On The Moonlight!